This fix is slightly modified animation .kf's from the vanilla DLC "The Pitt". Therefore if you use them in a mod it should have The Pitt as a requirement. Otherwise I'm happy to see this combined into other bug fixes. - 11 March - Added a corrected ground model to the Optional files section. The vanilla ground model is missing the side chains & while working on it I noticed it's also quite different in other ways to the held model. For example the blade on the vanilla ground model is placed on the other side of the chain guard (see images in Gallery). So as well as the missing chains I also made the ground model match the held version. To use the new version, download "Optional corrected ground model" & follow the same installation instructions as the main file. So uninstalling manually means just going to that location & removing that .nif. If you use the UF3P this file will replace that version of the ground model. (2) Long description, More detail for those interested in the what & why. 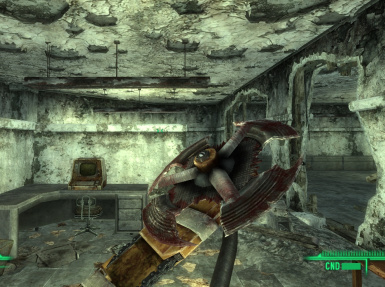 The Auto axe from The Pitt will turn invisible upon equipping & activating, usually only the first time. 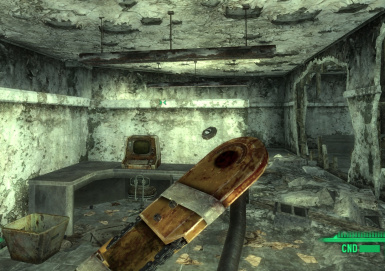 Users of the Unofficial Fallout 3 Patch (UF3P) will note that has a partial fix where only the blade is affected. I took a look at the Auto axe model long ago to see if I could fix this bug, tried everything I knew then but was unable to solve the problem. So I took another run at it, I've learnt a lot more in the intervening years & hoped I might crack it. My hunch this time was that it may not be the model itself at fault but rather it's .kf animation that controls it when held. All the settings seemed correct & then I spotted something odd. The controlling animations for the ##SawBlade are using BSRotAccumTransfInterpolator whereas you'd normally see a NiTransfInterpolator used for simple movements. The chains, which don't disappear when using the UF3P partial fix, use the normal NiTransfInterpolator. So I tried to see if the odd BSRotAccumTransfInterpolator could be converted to a NiTransfInterpolator by Right clicking it - Block - Convert - NiT... - NiTransfInterpolator. Sure enough there was the option to change to a NiTransfInterpolator & the blade's animation was unaffected. The results in game were that the Auto Axe no longer turns invisible upon use. I've tested for a bit but not done long term testing, so far there's been no visibility issues. Interestingly, after fixing the bug, I went & read Quazzy's entry for the Auto Axe in the UF3P's change log & they had speculated back then that the problem might be animation related. So just goes to show how clever Quazzy is. This mod replaces 4 animation .kf's - 1st person & 3rd person 2hmattackspin.kf, sneak2hmattackspin.kf & vats2hmattackpower_attackspin.kf. Therefore it will overwrite any mod added versions of those files when installed. 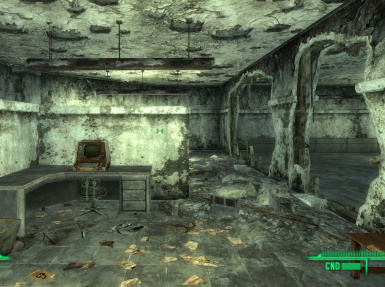 Q: Doesn't the Unofficial Fallout 3 Patch (UF3P) fix this bug? A: No, the excellent UF3P never found a complete solution to this bug. It was only able to limit the part of the Auto Axe turning invisible to the blade. Q: Does this clash with the UF3P? A: No, UF3P edits the Auto Axe mesh (dlcanchautoaxe.nif) & the weapon entry info. This fix only tweaks the 1st person & 3rd person animation files that the Auto axe uses. Q: I notice the dropped version of the Auto axe is missing it's side chains, is that related to this bug? A: No, the model used for the dropped version (dlcanchautoaxego.nif) is simply missing the chains. The UF3P contains a fixed version of that model. If there's interest I may upload an Optional file with a fixed ground model for people who don't use the UF3P. Big Thank-You Kindly to the makers of Nifskope, that essential model editing tool that makes so much possible. Thanks also to the Nexus for providing a safe home for mods, modders & mod users.